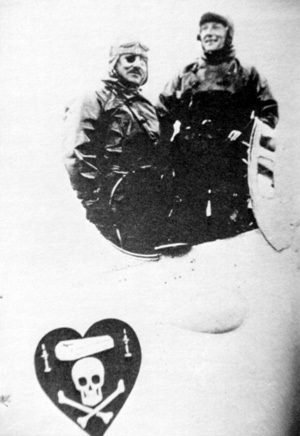 TIGHAR’s investigation into the disappearance of the French flight which nearly beat Lindbergh’s across the Atlantic takes its name from a quote by the Lone Eagle himself who described the lost aviators as having “vanished like midnight ghosts.” On May 8, 1927, WWI heroes Charles Nungesser and François Coli took off from LeBourget Field near Paris aboard their biplane l’Oiseau Blanc (the White Bird) bound nonstop for New York. Had they succeeded, the subsequent course of aviation history would have been very different. Instead, a frantic but fruitless search for the missing flyers dominated the headlines until Lindbergh’s takeoff just twelve days later. The French tragedy set the stage for the American triumph. Although it was ultimately presumed that Nungesser and Coli had crashed into the ocean, numerous and conflicting witness reports fueled widespread speculation that the flight had actually reached North America. Attempts to track down all the sources and witnesses petered out, however, and finally the searches were abandoned. The next time the Nungesser/Coli flight entered public consciousness was in 198o. Writer and scholar Gunnar Hansen wrote an article for Yankee Magazine telling the story of the flight, and relating folklore local to Washington County, Maine, about a woodsman hearing an airplane crash in 1927. That article, torn from the magazine and sent from one brother to another as a matter of curiosity, kicked around in a desk drawer for four years. But in 1984 the time had come to delve into the matter, and Project Midnight Ghost was launched, a full year before TIGHAR was incorporated. The seemingly impossible objective: solve the mystery by locating the wreckage of the largely biodegradable airplane. Gunnar’s article was about Anson Berry, a hermit who lived deep in the woods of coastal Maine. Was it the White Bird? Research established that the area was precisely on the flight’s planned route to New York. Although Berry was long dead, local living witnesses came forward to tell of hearing or seeing an airplane that day. No fewer than thirty hunters told of coming upon a large airplane engine partially buried in the ground. Beginning in 1985, TIGHAR assembled all of the available factual data on the flight, interviewed dozens of Maine residents and mounted a total of 20 wilderness search expeditions staffed by more than 200 volunteers, but found no hard evidence that such a crash had ever occurred. Other alleged discoveries of wreckage from the English Channel, to the Irish coast, to the shores of Nova Scotia and the forests of Quebec and Ontario were also checked out and found to be groundless. In 1992 TIGHAR’s search shifted to Newfoundland’s Avalon Peninsula where another body of folklore holds that an airplane crashed in one of the countless ponds which dot the the barren heights of the Cape Shore interior. This time the evidence, both archival and physical, has proved to be far stronger. In addition to extensive archival research, eight TIGHAR search expeditions (to date) have employed helicopters and sophisticated remote-sensing technology to find enough evidence to indicate that an airplane did crash somewhere within a specific geographical area. The time frame makes it highly probable that the flight was one of several vanished transatlantic attempts. The strongest candidate is l’Oiseau Blanc. The exact location of the crash, and therefore the conclusive artifact (the engine) remain to be found. The search continues.